Under sink organizers are great for the kitchen, the bathroom, the laundry room and any other room that has a cabinet under a sink. Below you'll find some of my product recommendations for getting the under sink cabinet organized and keeping it that way. Happy organizing! An under sink storage shelf like the product shown above is wonderful for maximizing the space since it takes the piping into account. Whether it's a customizable product like above or a general cabinet shelf, I recommend utilizing something that will make it possible to use all of the available vertical space. 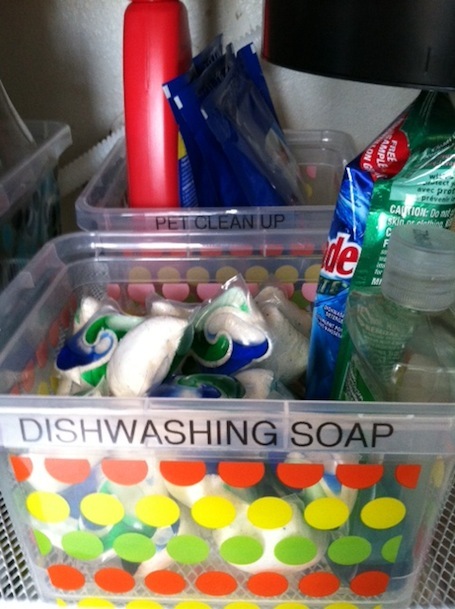 I like to use plastic stacking drawers like these in the cabinet under my bathroom sink. They are sturdy, stack well and come in fun colors. I would recommend you use a plastic storage drawer for small items (i.e. hair accessories) rather than pull outs (which are better for larger products like spray bottles). 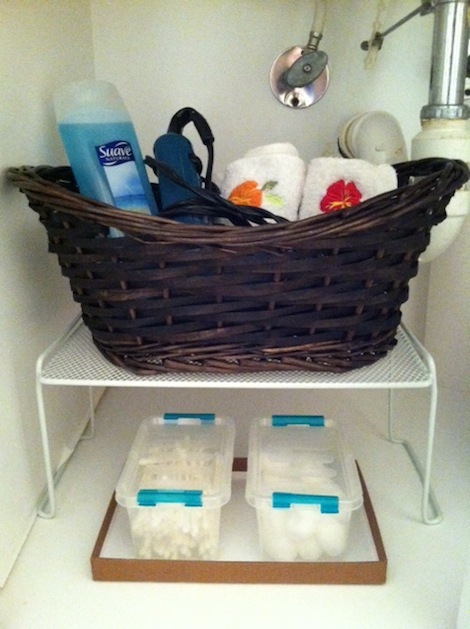 Pull out products like the one above are fantastic under sink organizers. Rather than kneeling down to root around in the under sink cabinet, this product brings the contents of the cupboard to you. Don't forget about the real estate on the inside of the cabinet doors! This is a really accessible location to store the few items you use the most. Here are some more fabulous cabinet door organizers. It's also a good idea to consider using a bucket or a caddy to store multiple items that get used together. For example, you could use a caddy to hold all of the cleaning supplies that you carry around the house while you're cleaning. A caddy is also useful in the bathroom - you could have one for each kid to keep their shared bathroom tidy.